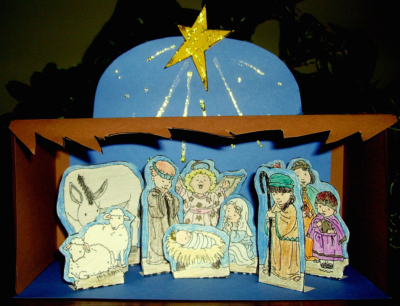 This is a “Pop-Up Nativity Scene” for the 3rd Grade to make so they can have a nativity scene of their own. The figures are a copy right item, so I’ve included the website address of where I ordered it. After you pay for the stamps you get easy download instructions. This website has loads of cute stamps to order and they are very, very reasonably price. Check it out by clicking on the web address included in this project. Supplies and directions for this “Pop-Up Nativity Scene” is in the 3rd Grade Projects Gallery in the sidebar. This entry was posted in 3rd Grade, Christmas Projects and tagged 3rd Grade, christmas crafts for kids, christmas nativity scene for kids to make, christmas projects for kids, jesus mary joseph in stable, nativity stable, pop-up nativity scene. Bookmark the permalink.